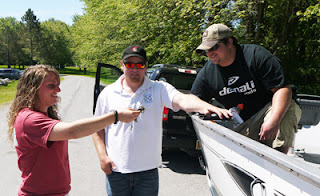 New York Sea Grant is hosting a webinar series on the logistics of starting and managing the watercraft inspection component of a water-based stewardship program. Registration is required for each of the WebEx-based individual webinar sessions at https://reg.cce.cornell.edu/WatercraftInspection_112.
. Watercraft Inspection Legislation and Regulations: A Facilitated Discussion with David G. White, New York Sea Grant Extension. For more information or assistance, contact New York Sea Grant Extension at 315.331.8415. New York Sea Grant, a cooperative program of Cornell University and the State University of New York, is one of 33 university-based programs under the National Sea Grant College Program of the National Oceanic and Atmospheric Administration. Through its statewide network of integrated research and educational services, NYSG has been promoting coastal vitality, environmental sustainability, and citizen awareness about the State’s marine and Great Lakes resources since 1971. For updates on New York Sea Grant activities, http://www.nyseagrant.org has RSS, Facebook, Twitter and YouTube links. 0 Comments to "Got water? Got boats? NY Sea Grant to Host Watercraft Inspection Webinar Series"